Originally released for Free RPG Day 2017, now available to anyone wanting to try this game. 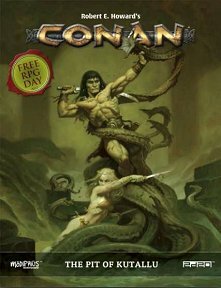 Publisher's blurb: "The Pit of Kutallu is a scenario which was part of FREE RPG Day 2017 and is self-contained standalone adventure featuring a cut down version of the 2d20 system for Robert E. Howard's Conan: Adventures in an Age Undreamed Of, a game of dramatic pulp adventure and heroic conflict. "The adventure itself strands the characters in an exotic ruin, pitted against ancient evil takes place on the southern coastal jungles of the Black Kingdoms, with the player characters recently captured by Kushite slavers. The adventure opens with the player characters in the hold of their captors' ship, just as it is caught in a storm. "The adventure introduces game concepts as they are encountered, to help everyone start playing Conan as quickly as possible and full rules and pre-generated characters are included and you can also download additional free characters on the Modiphius site."